A statue of Princess Diana has been commissioned by the Duke of Cambridge and Prince Harry, 20 years after her death. The two princes said that "the time is right to recognise her positive impact" with a permanent statue. The sculpture will be erected in the public grounds of her former residence, Kensington Palace. A sculptor has yet to be chosen but a spokesperson said work on the artwork would begin soon. Princes William and Harry said in statement: "It has been 20 years since our mother's death and the time is right to recognise her positive impact in the UK and around the world with a permanent statue. 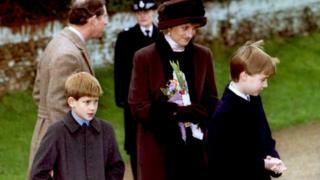 The Queen has said she "supports" her grandchildren commemorating Princess Diana. Royal historian Kate Williams told the BBC it was an opportunity for the princes to "put their stamp" on their mother's legacy as "a great charitable patron". "The princes have really taken up her mantle of the charity work - particularly of looking at the Cinderella causes, that don't get that much attention," she added. The Princess of Wales died on 31 August 1997 in a car crash in Paris, when the Duke of Cambridge was 15 and his brother was 12. The princes' statue will be the fourth London-based monument dedicated to Princess Diana, and will be close to the Princess Diana Memorial Fountain in Hyde Park, and the memorial garden close to Kensington Palace. An artist will be chosen by a committee of six people, which includes Diana's sister Lady Sarah McCorquodale. Camilla Tominey, royal editor of the Sunday Express, said: "This is Harry and William saying that want a more permanent and personal memorial to their mother. They were too young when she died to have any role in the memorial." She added: "There's a sense that people want to go somewhere and pay their respects two decades on." This national monument to the wife of one future king and the mother of another has been a long time coming. The Queen Mother statue was unveiled seven years after her death. Some of Diana's friends have argued it would be difficult to capture the princess in stone. Others have questioned whether the failure to do so was more a reflection of establishment ambivalence towards what Diana represented. Until now, the main memorial has been a fountain in London's Hyde Park. For its supporters, the granite structure embodies the princess's spontaneity. Its critics have likened it to the outflow from a power station. As children, Prince William and Prince Harry watched as controversy surrounded the building of this fountain. As adults, they're using their wealth - and that of others - to erect a statue of their mother. The announcement comes after Prince William said his mother's death made him "very angry". The rare admission was made during a visit to a London bereavement centre. Her death led to an international public outpouring of grief, marked by millions of tributes being left at royal residences for many months. It is thought her funeral was watched by two billion people worldwide. In July 2016, Prince Harry said he did not talk about his mother's death "for the first 28 years of my life". The 20th anniversary of Princess Diana's death will be commemorated by Earl Spencer, her brother, with a host of exhibitions at the family's home in Althorp.